This once blackened item has stood on the tip of a tower in the Tarnish for many years. Once the soot is scraped off and the item is clean and polished, it is revealed as a high quality silver magical item. 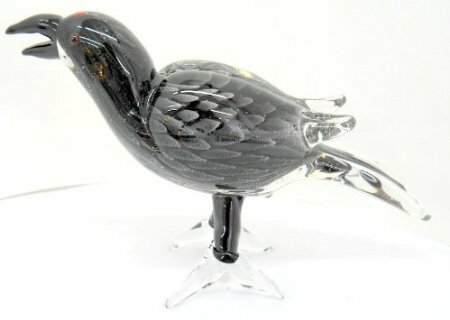 This silver figurine turns into a raven on command (but it retains its metallic consistency, giving it a hardness of 10). Another command sets it off into the air, bearing a message just like a creature affected by the spell Animal Messenger. If not commanded to carry a message, the Raven obeys the commands of its owner, although it has no special powers or telepathic abilities. The non figurine status can be maintained for only 24 hours per week but the duration need not be continuous. If sent out on a quest, the Raven will wait for a return message before flying back to its “owner”. If none is received, it will return at the end of the spell duration, arriving to its “owner” no later than 3 days after it was first sent. If the raven is killed or in any other way prevented from returning to its owner, the Figurine is destroyed at either the time of death of the raven or by the end of a three day period in which the messenger did not return. P.S: This item was sold by Schmidt Happens to an unnamed collector of Mysteria.